As building regulations have changed houses have become increasingly air tight, leading to the challenge of how best to ensure that stale air in the house is replaced with fresh air, without losing heat from the house. Traditionally we have relied on window trickle vents for ventilation, but these are uncontrolled, get easy blocked, and householders close them, which all renders them a poor and inefficient solution. Heat is lost through trickle vents, which has to be replaced by the heating system, increasing energy bills. The principles of how a mechanical ventilation and heat recovery system (MVHR) works is very simple: contaminated stale air in the house is continuously replaced by warmed, fresh, filtered air. Importantly, a highly efficient heat exchanger is used to recover over 90% of the heat from the stale air and transfers it to the incoming air. The end result is a high performance ventilation system that keeps your home supplied with clean, fresh, warm air. 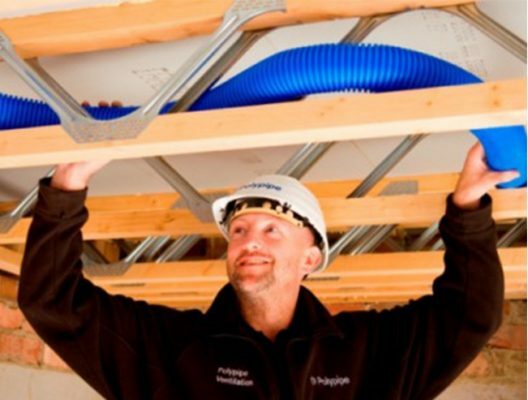 A central unit, comprising a fan and heat exchanger, is installed in the house, usually in the plant room or loft space. 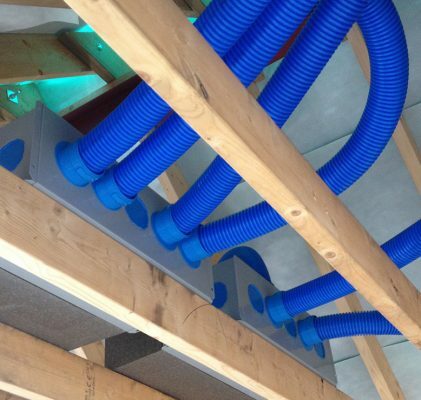 Duct work runs from the unit to each of the rooms in the house, and terminates in a ceiling vent. Warm, humid and stale air is extracted from the bathrooms, utility and kitchen, and passes through the heat exchanger. The now cool stale air is the extracted outside via a duct, at the same time fresh cold air is drawn into the house via a separate duct. This fresh air passes through the heat exchanger and is warmed up, and then distributed throughout the house via duct work into the other rooms in the house, such as the living room, dining room, hallway, and bedrooms. 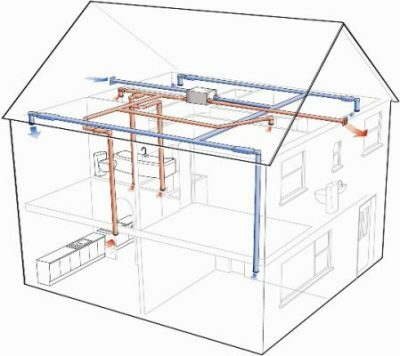 The inclusion of an MVHR system should be considered at an early design stage, so a location for the unit can be allowed for, and the duct work through the building can be accommodated. 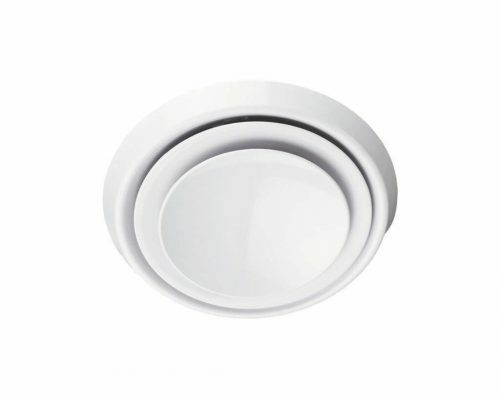 The commissioning process, which involves adjusting the vents to the correct air flow rates, ensures the air flow throughout the house is balanced, and the system is working efficiently. Contact EnergyMyWay now if you are planning a new house, so we can help you build a house that has a healthy living environment and low energy bills.